Hello and welcome to the Friday Focus on Prima! It's Nancy here, kicking off the celebration of all things Prima at The Funkie Junkie Boutique. That means all Prima products will be available at an additional 15% off until May 13th! 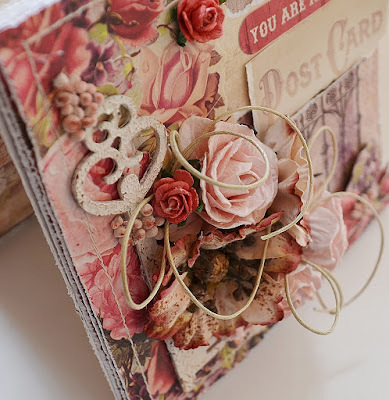 Today I'm sharing a card created with one of Prima's fabulous new paper collections, Tales of You and Me! 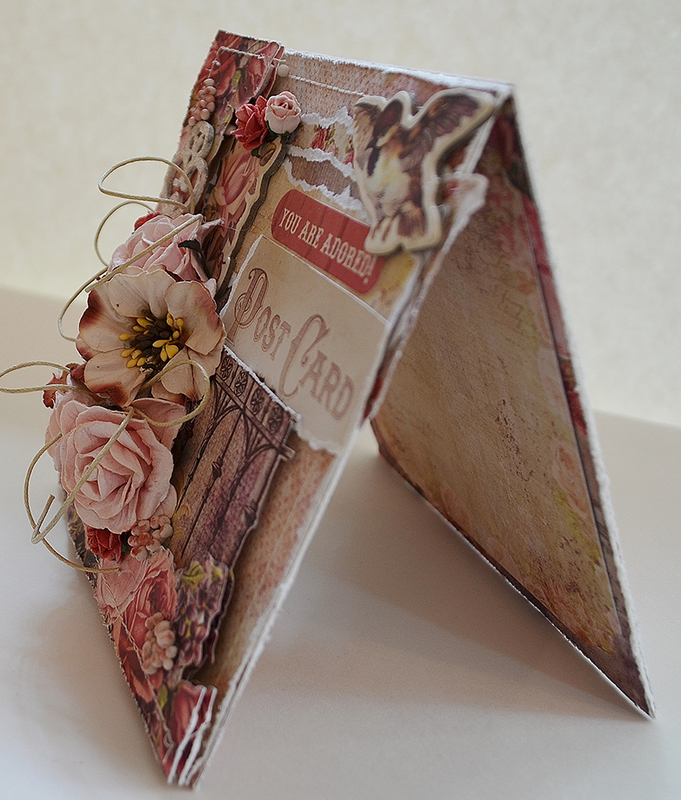 The base of the card is formed by distressing, layering, and stitching the papers. Next comes the fussy cutting (a lot of it!). Multiple layers of the same design are carefully cut, popped up with foam adhesive, and layered to create a dimensional garden. 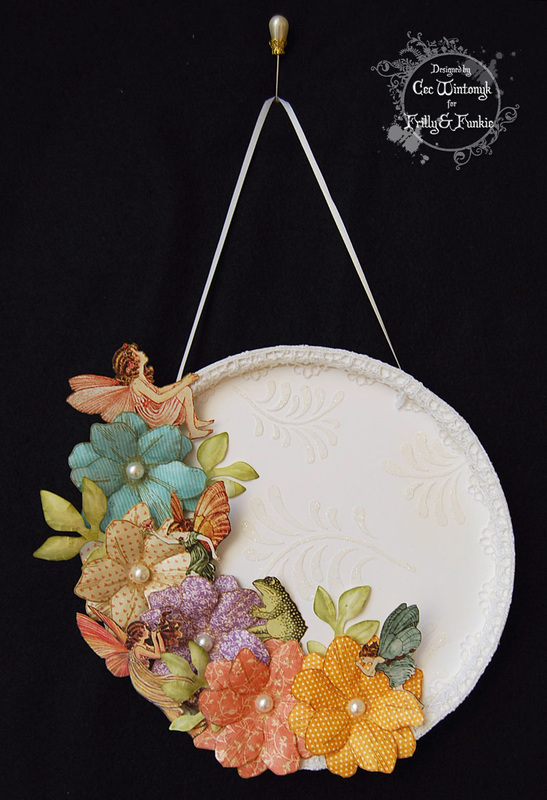 Linda is now carrying a large variety of mulberry flowers in her shop! 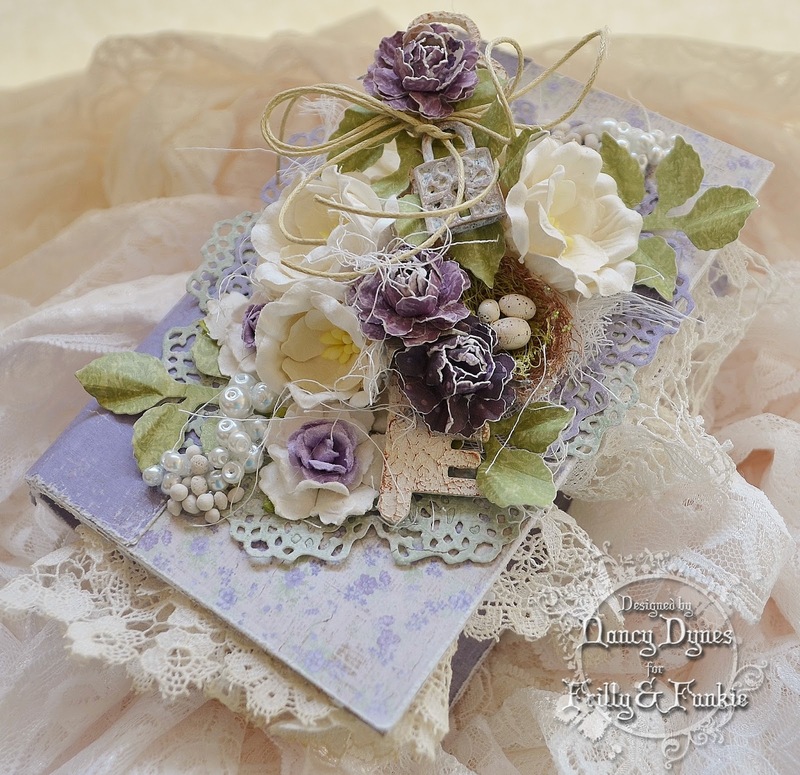 I stained the white wild roses with distress spray to coordinate with the colors of the paper collection. I also added a few other flowers from my stash to complete the bouquet. The altered wooden key is coated with Prima Heavy White Gesso and crackle texture paste, then aged with Vintage Photo Distress Ink. I added two natural twine bows to this card. One just isn't enough anymore-lol! Prima art stones are tucked into the nooks and crannies of this garden. 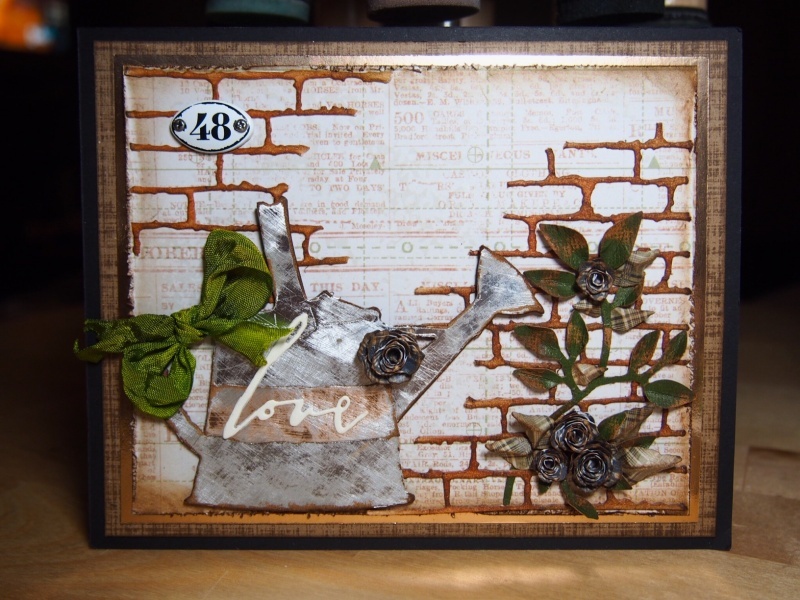 They're tinted with three different shades of Tim Holtz distress markers then gently misted with water. The sentiment is a sticker from the paper collection! 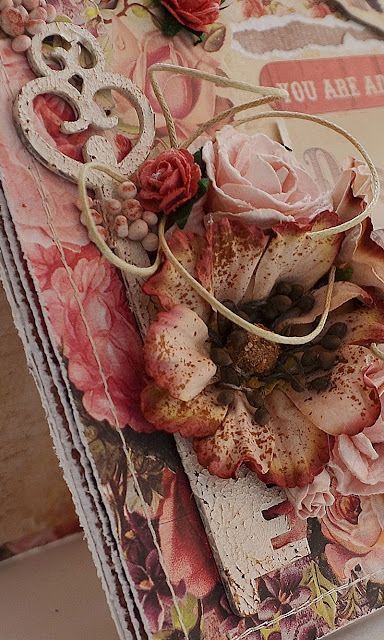 It's layered on top of several layers of design paper that have been 'artistically' torn. 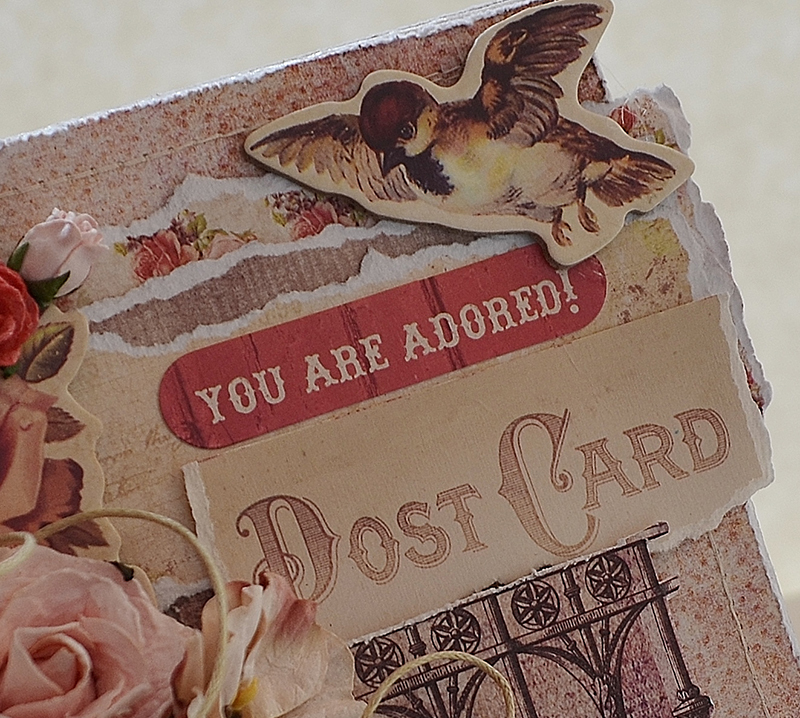 You'll also find a sweet Prima chipboard bird and rose embellishing my little flower garden. The chipboard pieces are self adhesive, making them simple to adhere to your projects. 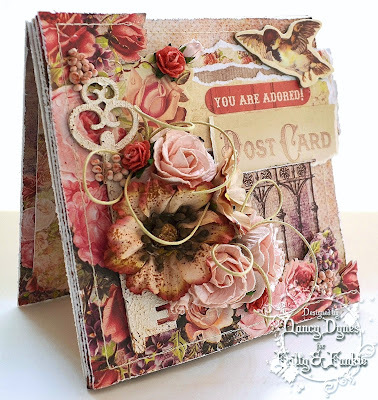 Thank you so much for stopping by for a peek at my card!! Now it's time to treat yourself to the some Prima goodness from The Funkie Junkie Boutique! 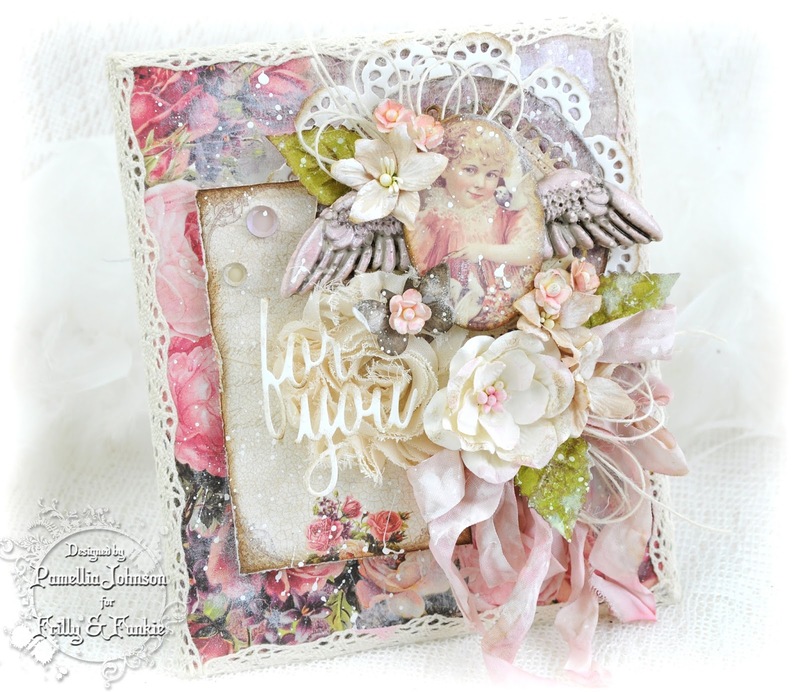 I've shared only a tiny sample of the new Prima inventory Linda offers in her shop. There's so much more to see, so grab a cup of tea and relax over some well deserved retail therapy! Ranger ADHESIVE - WHITE FOAM ROLL 1/2" X 1/16"x 2.1 YDS. Prima Art Basics - Heavy Gesso - White 17 fl. oz. Hi! Suzz here. I am hosting a challenge in honor of Earth Day, which is April 22nd. 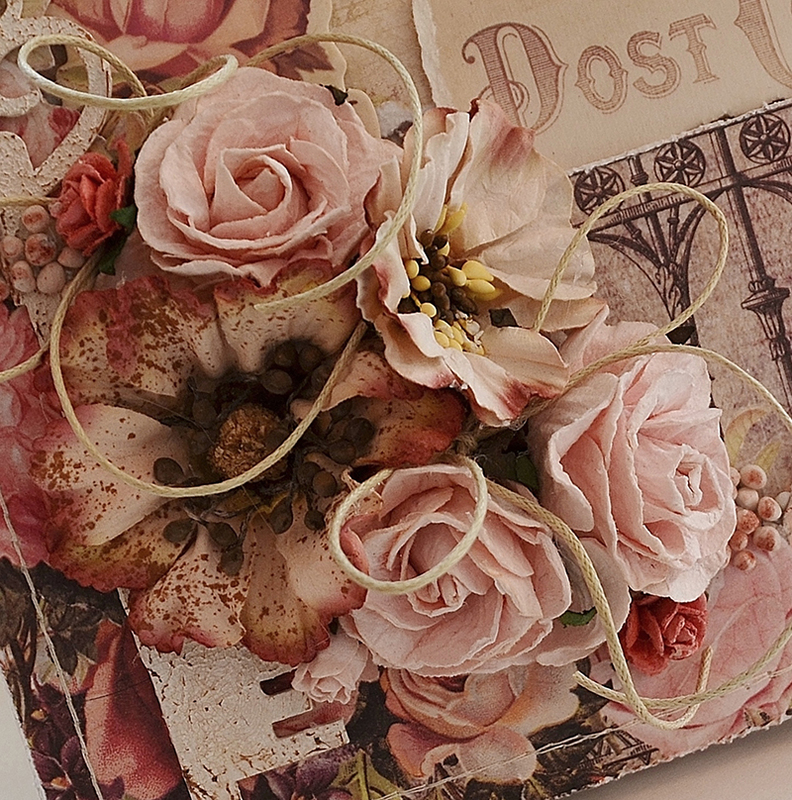 For this challenge you can create any type of project as long as you UPCYCLE or re-cycle something. 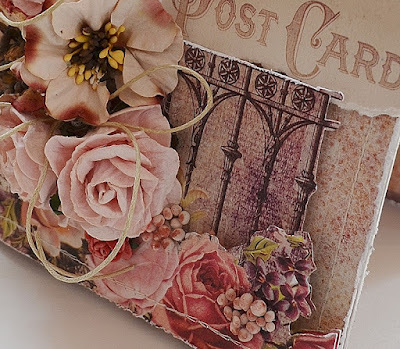 Re-purpose an existing item, recycle an element that usually would be thrown away or use your paper scraps in a creative way. 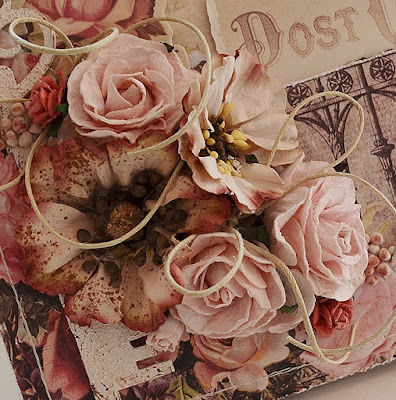 The guidelines for entering are simple: create a new vintage or shabby chic project following the challenge theme, link it below to your post (not just your blog) and also include a link back to this challenge in your post. 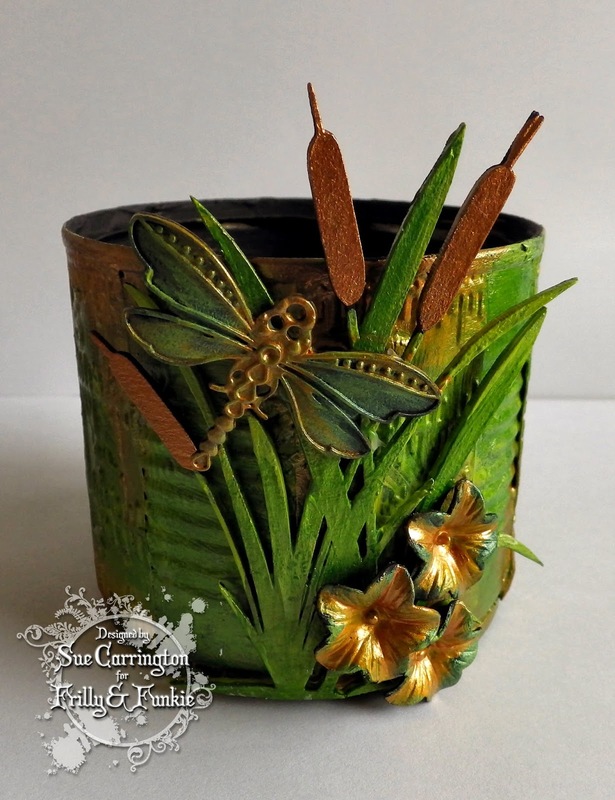 For this challenge also include in your description what you up-cycled or re-cycled. You can combine our challenge with up to 10 challenges (including this one) to be in with a chance of winning. If you are entering through a public forum please use keyword F&F. Also, please be sure to turn off your Word Verification so our Design Team can leave comments on your blogs. Does that have your imagination sparked? Look around and see what could use a little up-cycle or dig through those re-recyclables! Get creating and come back and share with us your art! Challenge Winners - Boy oh Boy! Welcome to the beginning of a new week and our latest winners here at Frilly and Funkie! Thank you so much to everyone who took the time to enter our 'Boy oh Boy!' challenge; there were some fantastic entries to choose from and the Design Team loved looking through them all. After much deliberation we chose our winner, #3 Samra (Paper Talk With Samra). 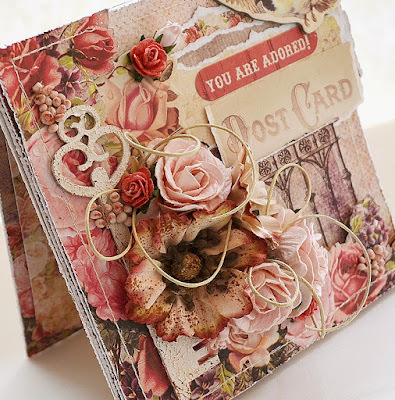 We loved the whole film theme, contrasting shades and clever 3D design on this beautiful creation. 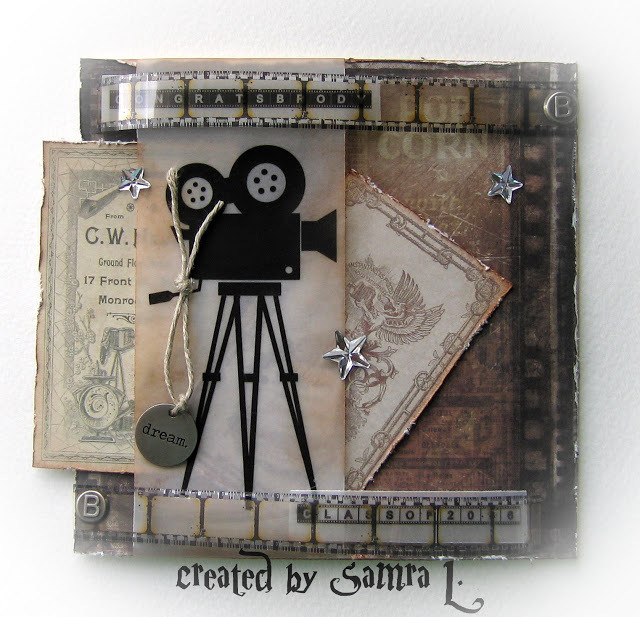 Congratulations Samra on being our favourite for the 'Boy oh Boy!' challenge and winning the opportunity to be a Guest Designer here at Frilly and Funkie for a future challenge. And now for the next three outstanding winners of our Frilly and Funkie Top 3 Badges. 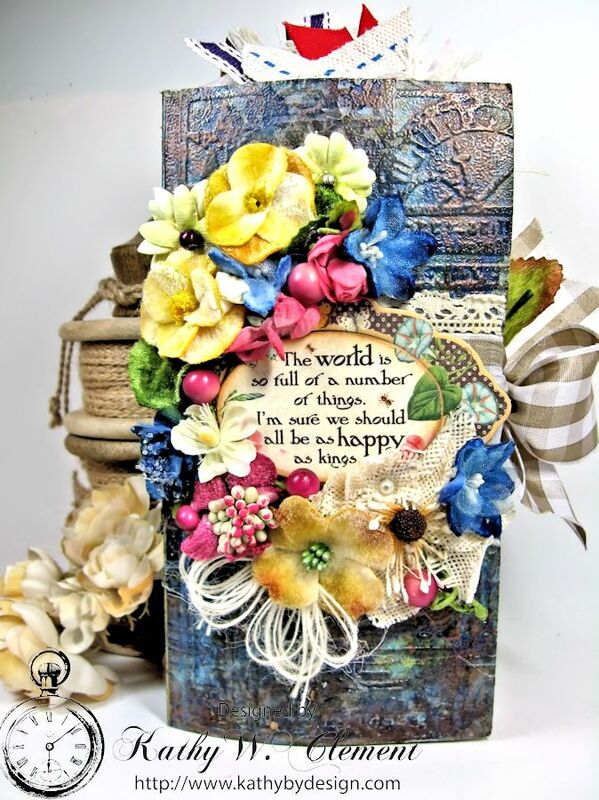 In numerical order they are... #5 Inkysplatters #12 Autumn (Sew Paper Paint) and #15 Debbie (Oz Paper Scrap Art)!!! Please email Linda at thefunkiejunkie@gmail.com for the codes for the Top 3 badges so that you can display them proudly on your blog. And finally Random.org has chosen a lucky winner for the $25 gift certificate to The Funkie Junkie Boutique. Our congratulations this time go to #7 Debi B! A huge thanks from the Frilly and Funkie team to everyone who took part in this challenge and congratulations again to our winners. Please email Linda at thefunkiejunkie@gmail.com for the codes for the winner's badge and to give us your email address for the Guest Designer details (Samra) for the Top 3 badges (Inkysplatters, Autumn and Debbie) and for the gift certificate details (Debi). Our current challenge, ''It's Not Easy Being Green!" runs through Tuesday, May 3rd . We hope to see you entering this time around so that you too can be in with a chance to win. 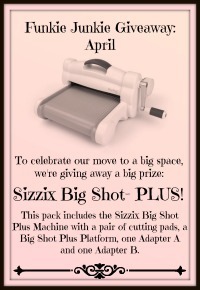 And make sure if you're based in the US you've entered the April Funkie Junkie Giveaway - there's only 5 days left to be in with a chance to win yourself a Big Shot Plus!!!!!!!!!!! Challenge Winners - Hip to be Square!